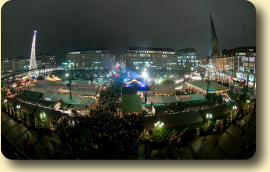 Discover history, tradition and a Hanseatic heritage at one of Hamburg's 30 wonderful Christmas markets. Against the mesmerising backdrop of the historic City Hall the Hamburg Christmas Market is filled with hand-crafted Christmas decorations from the Erzgebirge region and looked after by woodcarvers from Tyrol, bakers form Aachen (producing their famous “printen” cookies on the scene) or gingerbread makers from Nuremberg and the pottery is made by artists from the Lausitz region. Silversmiths and many other artisans and craftsmen from all over Germany invite you to marvel, join in, taste or simply enjoy this fantastic atmosphere in Hamburg. Old-fashioned carousels bring a gleam to everyone's eyes, not just the children's. Hamburg has so much to offer during the festive season: you can enjoy a mug of glühwein on a lake Alster boat tour or you could visit a Christmas exhibition in one of the city's museums. 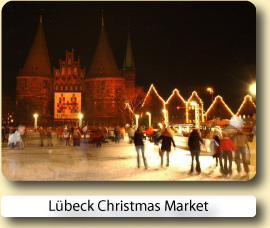 There is a Christmas parade through the festively decorated city centre every Saturday during Advent. It's a magical time for young and old alike in Hamburg's theatres or on a 'fairytale ship' anchored along the Jungfernstieg promenade. Every day at 4pm, 6pm and 8pm Santa Claus will be flying his reindeer sleigh up to the sky high above the roofs of the Christmas Market cottages telling the story of Rudolph the red nosed reindeer. Every advent Saturay the Hamburg Christmas Parade is a colourful and cheerful procession through the city center. It always starts in Mönckebergstraße at Galeria Kaufhof / Saturn. For shoppers a tour through the decorated streets and malls of the city center has a very special appeal in the Christmas period. The elegant boutiques, department stores and shopping malls can easily be reached on foot and offer a wide range of attractions, many stores even stay open longer during the Christmas season. Overlapping the start of advent is the Hamburg Dom at the Heiligengeistfeld. The Dom is the largest funfair in the north of Germany, promising lots of fun for everyone. 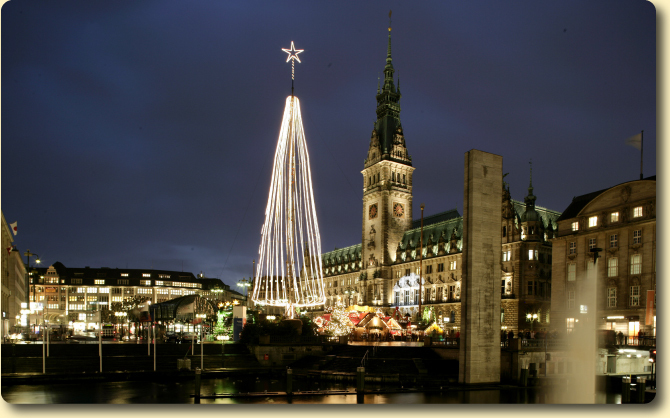 A visit to Hamburg in the run-up to Christmas is surely something you'll never forget! 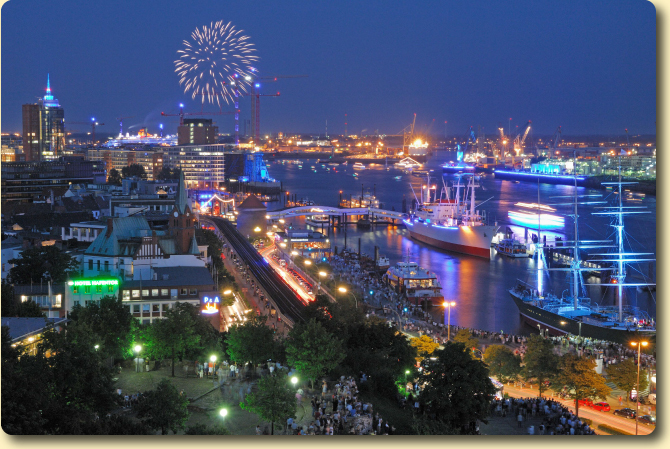 The Free Hanseatic City of Hamburg is Germany’s second largest metropolis and has one of Europe’s largest ports. Hamburg’s role as an international centre is reflected in the elegance of its merchants’ villas and boulevards, the international musicals staged there, the luxurious shopping arcades and the St. Pauli district. The Reeperbahn in the St. Pauli district is where the Beatles shot to fame in the 1960s, it is Hamburg's top entertainment quarter. On the other hand, Hamburg's city centre is the only one in Germany situated on the shores of a lake, the Alster. The Outer Alster, the larger part of the lake at 160 hectares, is a paradise for sailors and rowers. lined with warehouses and residential buildings from the 17th to the 19th century. creation of this gigantic set. No visit to Hamburg is complete without a boat tour of the port, which departs from the Landungsbrücken quayside. From here it's just a stone's throw to the Old Elbe Tunnel, an eye-catching domed building whose four huge elevators have been transporting pedestrians and vehicles almost 24 metres underground since 1911. There is a taste of far away places throughout the city, even in the little canals and waterways of the old warehouse district. The Park Hyatt is situated in the city center. 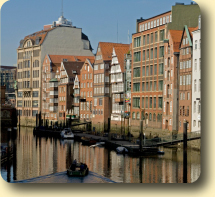 It is a short walk to Hamburg's main shopping district. 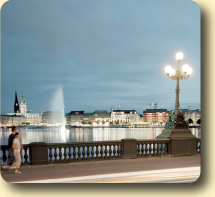 The hotel is also within a short distance to Alster Lake which is a beautiful sight to see. Everything is great about this hotel. We loved the quiet, well-designed room. The location was superb and the staff were very helpful. 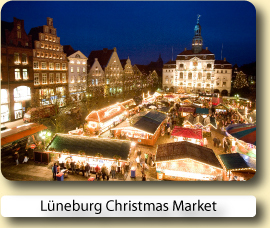 Buy a one day German Rail Länder Ticket and you could explore all the Christmas Markets in the state of Schleswig Holstein & HH for one amazing price of: One passenger: €28 Extra person: €3 Unlimited travel, one price, through out Schleswig Holstein & HH (see map above) for up to 5 people, 9 a.m. until 3 a.m. of the following day and on Saturday, Sunday and bank holidays from 0a.m. until 3 a.m. Valid on all local trains (Interregio-Express, Regional-Express, Regionalbahn, S-Bahn). Prices quoted are for 2017 ticket machine purchases only. 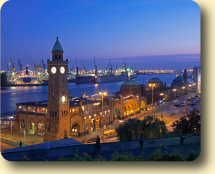 Discover Hamburg with a hop-on/hop-off, double-decker bus tour. Cruise through the elegant Havestehude, visit the famous Reeperbahn, or shop on Mönckebergstraße on this 27-stop individual sightseeing tour. Gain informative insight into Hamburg's working harbour with a sightseeing cruise that steers you past the historical "Speicherstadt" warehouse complex, as well as several harbour basins, and container terminals. Get onboard Hamburg's first music bus and see the city's musical sights such as the Reeperbahn where the Beatles got their first break. 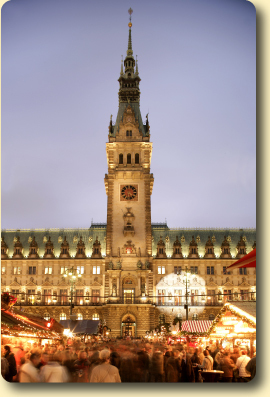 Book your hotel for the Hamburg Christmas Market with Expedia or Hotels.com.Both online reservation services will let you compare and book hotels at great low prices.